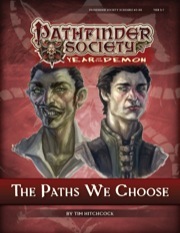 The failure of Mendev's wardstones set in motion not only a new crusade but also catalyzed a change in the Pathfinder Society's various factions. As the Pathfinders prepare to march on the Sky Citadel Jormurdun, members of the various factions scramble to consolidate their gains and neutralize their enemies. "The Paths We Choose" is a special event designed to highlight the changes in each faction over the course of Season 5, The Year of the Demon, and the adventure is different for each group depending on which factions are represented at the table. Content in "The Paths We Choose" also contributes directly to the ongoing storylines of the Andoran, Cheliax, Osirion, Qadira, Sczarni, and Taldor factions. This adventure kicks off Season 6, The Year of the Sky Key and is for character levels 3-7. I played this scenario just a few hours ago with a party of 6 on the lower tier. Our GM was Kludde who already voiced his opinion on this scenario months ago and which can be found below. I wholeheartedly agree with everything he has said, especially his comment on the structure of this scenario. That is immediately my only issue with this scenario: it's a bit chaotic and unstructured at times. It's hard to keep track of everything, regardless of whether you're a player or the GM. I firmly believe that if it had been structured akin to the Silverhex chronicles, this would have been solved and made this scenario a must for every player out there. That aside, I really enjoyed this scenario. I really appreciate the diversity it offers. You get learn about all current factions and get introduced to the city of Absalom and all its neighbourhoods. So many things to do, so many things to see. As for our group, we were planning to do the Sovereign Court, Scarab Sages and Exchange missions due to the characters present. Starting with the Sovereign Court, I can easily see why people enjoy this part a lot. It simply is a lot fun and we had the right tools for the job. My mesmerist is build for situations like this and provided with enough distractions for the rest of the group to do the dirty work. What can I say, I just love intrigue and diplomacy. Seriously, sidequests like this are what I as a player am looking for, especially when playing my mesmerist. The final speech by lady Morilla actually convinced my character to consider switching from The Exchange to the Court – while at the same time making a different partymember leave this faction and possibly joining the Exchange. It's nice how things directly influence the way my character evolves. Next up we ended up helping our Osirion friends. We had some initial issues convincing a travelling vendor of goods. Given the fact he had to flee, we had the brilliant idea of summoning a pit right under his feet in the middle of the street. Luckily my mesmerist managed to convinced the crowd that everything was fine and that they needn't worry. We followed the leads given to us and ended up in a nice encounter with some hostile NPC's. It was pretty straight forward, but still enjoyable. When we were told what the objective was for the Exchange portion of this scenario, we stumbled across a little issue. A few of the characters didn't feel inclined to help because of in character reasoning. Half the party wanted to do this, two were simply against helping that individual and the last person was a bit hesitant as well. Let it be said that it's not a problem with this particular mission, but simply with our own characters and their personalities. Sensing this particular quest wouldn't really be enjoyable for everyone present – which is after all the main goal of playing this game - our GM suggested we'd do a different one instead: namely Liberty's Edge. As it turns out, the Liberty's Edge quest he proposed was perfect for this group. The premise simply spoke to all of us. The swashbuckler already was part of that faction, while mentioning a corrupt noble was enough for the rest of us, albeit it for different reasons. We were all fired up instantly and didn't hesitate at all. The GM did a great job. As for this sidequest, I have to admit that we were lucky with our first few dice-rolls. This in turn made it end rather quickly. That's not to say it was disappointing as a result: we had a lot of fun with our less than optimal, yet highly successful apprehension of the suspect. Even though it ended early, this wasn't seen as an issue at all. I could go on for a while more, but this is long enough as is. This scenario offers amazing diversity and will have something that everyone can enjoy. My only issue is the way it is structured, which is why it 'only' gets four stars out of five. Overall I highly recommend this scenario. I ran this module twice on the Paizo PbP boards, for two different sets of faction. The module really does feel like a follow-up on first steps, and there are definite upsides to that. - There's a significant social backdrop to everything that is going on. I had quite a bit of fun making with a 'pathfinder party', making oblique references to player's other PC's, referring to past events, and generally playing out the encounters. There's plenty of 'time' for this in a PbP, though I'm not so sure how it would pan out in RL. - You'll be using less than half of all quests, so it's a good idea to ask what factions you'll have at the table before preparing the run. - It's a real delight to have factions at the centre of attention, rather than being the - sometimes forced - afterthought to a scenario. - The quests I ran were Silver Crusade, Osirion, Grand Lodge, Liberty and (my favourite) Sovereign Court. They were each quite interesting set-ups, especially for their shortness. Looking at the structure of the scenario, it actually bears close resemblance to the silver hex chronicles: these were all 1 hour - or so - quests that have been put together as a scenario. They could have been put in a format similar to the silverhex quests, and this would have allowed some more flexibility in running the 'paths'. I'm secretly hoping for something along those lines in the future. I certainly applaud the effort to put more depth into the various factions. This module feels like a higher level version of "In Service to Lore" - you get to meet the faction leaders and then go do an assortment of random tasks for them. That works for 1st level characters, and feels a bit weird for a level 3-7 mod. There were some interesting challenges, and a couple of entertaining moments (like my gnome using "Speak with Animals" on the fish, and then realizing that it could talk normally) but there's definitely a lack of over-arching plot, and it certainly doesn't feel like the cool transition between Season 5 and Season 6 mod that I thought it was going to be. Scenario #5–99: The Paths We Choose is more time consuming to prepare than most scenarios and half its content will not be run. Much of the justification for faction changes could be covered in blog posts and faction letters, much like we saw weeks ago. It's about as climactic as a blog post, too. If this scenario’s goal was to provide a meaningful introduction to the factions post Season 5 it is my opinion that it failed. 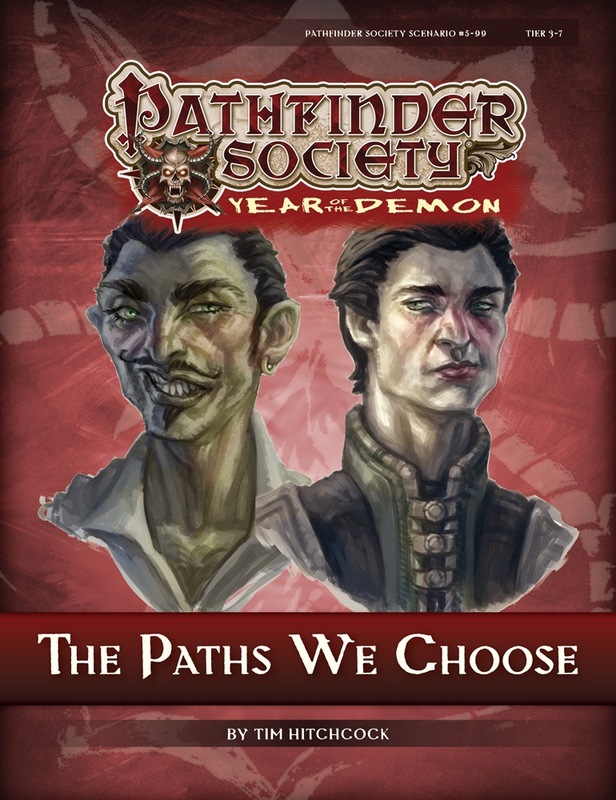 That said, I approve of what Paizo has done with factions, but I recommend skipping #5–99: The Paths We Choose if you have another option. Announced for July! Keep in mind that it won't be available for normal purchase until just before Gen Con 2015 but is available for regional conventions and game days. As this is specific to the faction changes occurring at the beginning of season 6, can I ask why the non-convention players have to wait a year before it is available. In a year's time it will be almost irrelevant, vs in a couple of month's time when it is very relevant. What level of GM do you need to be to run this event? I would love to have this one and #6-00 run together as a special event in our area sometime soon after Gencon. Non-convention players should petition their local Venture Officers to organize a local game day that can meet the table requirements to allow this scenario to be offered. If you do not have a local Venture Officer, I encourage you to organize the game day yourself so that you and your fellow players can enjoy this scenario as soon as possible. There is no GM level requirement. Anyone may run it at a game day or convention. Make sure to talk to your local VO to get it scheduled. too bad that a capstone adventure for the season is set so low. most of the characters played though the season may be too high to play this! Good thing it isn't a capstone adventure and is the kick off for Season 6 then! Mmmm...that doesn't actually answer my question. After all, what is the difference between a small convention and a game day with enough tables to qualify to run this. What I am trying to point out, obviously not clearly, is that ALL the PFS players in the world could benefit from this scenerio, but only if it is offered at the time when the changes are taking place...not when the changes are a year old. I normally don't complain about convention exclusives, and understand that the normal Gencon special needs a certain amount of tables to run correctly, but I stongly feel that this particular scenario has a certain time period when it would be incredibly helpful to the whole player base, not just those who can make it to games days, or conventions. I will bring it up at the PFS meeting tomorrow. I understand your point and certainly wouldn't want people to miss out on it since there are such important fundamental changes to the campaign. But, there are some specific restrictions that make it a little difficult for a lone table of six different factions to just pick it up and run it. It is why we were gearing this toward conventions and game days of 15 tables or more. It is important to try to limit the tables to 3 factions or less (except for Grand Lodge and Silver Crusade). Edit To clarify, by limiting to 3 factions or less, it includes Qadira, Taldor, Osirion, Scarzni, Andoran, Cheliax, and Osirion. Grand Lodge and Silver Crusade can be added as a fourth and fifth faction at the table with no problems. However, if you have four or more of the other factions, it could be very tough to finish the scenario in the allotted time frame. I believe the requirement is 15 tables over the course of the event. That's 5 tables a day for a three day weekend. Edit: Thank you for that confirmation Mike and answering the question I couldn't. I will bring it up at the PFS meeting tomorrow. I understand your point and certainly wouldn't want people to miss out on it since there are such important fundamental changes to the campaign. Thanks Mike, I appreciate you listening. I edited my post to include more info. Please take a look at it again. I had listened to John's Know Direction podcast, so understood the three faction thing, but didn't think that though as why the game day restiction. I suppose that, from my point of view, it sounds so cool that I really want to play/DM it right now...ok, when it is released. I do "sort of" game days, but they are at our home, but can have more than one table running at once. Trust me, I understand. When I was a VC, we would host four simultaneous tables at my house in the first slot, and four or five tables in the second slot on every other Saturday until my wife threw us out. I would like to echo some of the other posts about the availablity of the scenario. I play in the Perth, Western Australia area, and while we have a nice little community going but there is no possiblity of anything close to a 15 table event. We managed 5 tables on one day for the Season 5 launch event and that was a real stretch for us. We are also very isolated from the other Australian PFS groups so it would be hard to join them. Keep in mind, not just for this, but to receive boons, product prize support, etc... it just needs to be 15 or more tables over a three day weekend, not all in one day. Given our small player base and limited venues I don't think we would be able to get 15 tables over 3 days. The effort to get 5 tables at once was quite monumental (but also good for getting new players) and I can't picture how we could replicate that over two more days. We also don't have a venue that could accomodate 5 tables a day, for 3 days. Obviously the job of our VC, Chris, is to work on changing the above cirumstances but Perth is (relative to the US or the Australian cities on the east cost) small and in the middle of nowhere. So just our population base is big disadvantage. If it is at all possible for Paizo to consider letting smaller Society chapters play it, while the story is relevant, it would be amazing. We do. I make a case-by-case decision on all regions outside North America. I had dinner with Callum a month a go and we discussed the challenges with Perth specifically. I'm also working with Chris to hopefully help the region grow. There *is* the option of hooking up with the Online Collective for an online Game Day event. Question about the 15 tables thing... does this have to be 15 tables all playing THIS scenario, or can it be three slots of 5-6 tables each, playing this scenario, Siege of the Diamond City, and #6-00? In other words, could I work with our local VC on putting together a game day in a venue with 5 tables to run all three of these special events, and have it count toward the number of tables required? Or do you have to run 15 tables of each scenario? Cuz that part would be tough. From experience it is an event, over several consecutive days, that is hosting 15 PFS tables or more in any mix of offerings that are sanctioned for credit. Yeah, the scenario itself may have its own limits of minimum tables (for example, 5 simultaneous tables for Siege of the Diamond City), but shouldn't be requiring 15 tables as once. I would like to add my voice to this not being an 'exclusive'. While I've had great fun playing Race for the Runecarved Key, and Blood over Absalom (and likely Diamond City when it becomes available)* none of these have been as 'game changing' as The Paths We Choose sounds. Based on the limited data, I'd say please open it up and skip the exclusion period. Exclusive or not I am definitely looking forwards to this one. Based on the information Mike's provided, scheduling sudoku for non-gameday-or-larger events seems like a potential for REALLY bad table mixes where there isn't time to accomplish all of the faction plugins for a modular scenario. 33 people marked this as a favorite. Ok all. After discussing it at the meeting today, the team has decided this scenario is just too important to the fundamentals of the Society for anyone to miss. So, it will be available for open play with no minimum table requirements. Enjoy! When would be the earliest that this scenario can be run? Second day of Gen Con. So, August 16, 8 am EST. Awesome decision, guys. I was holding out on adding my feedback, and am very happy you circumvented it. I am looking forward to scheduling this in August. Edit: One little bit of feedback I should still give you: this scenario should have been coded #6-00 while that scenario should have been coded #5-99. If this one launches Season 6 it seems strange to include it in Season 5's sequencing, while that is the finale of Season 5 and is included in Season 6's sequencing. A nitpick, but still, it seems some confusion is inevitable and could have been avoided. Thank you Mike for both the reply and the change from the minimum table requirement. Great news! Thanks a bunch Mike, and all the team. Very much looking forward to this scenario. Hopefully our community will grow enough to run 15 tables in the near future! Thanks Mike. It makes a lot of sense to do it this way, it really does. It'll be quite interesting to prep for Gencon I'm sure. :) Can't wait. You know... I had the same thought, Drogon... ah well. Awesome! Thank you for the revisit and the yummy goodness. I just want to add all my thanks as well. I can't wait to run/play this. Thanks Mike...I love you all for your willingness to listen to us. I'm not (yet) a regular PFS player but I must commend Mike and Co. on this decision. This is a great choice for the community and another example of Paizo's excellent community interaction. One little bit of feedback I should still give you: this scenario should have been coded #6-00 while that scenario should have been coded #5-99. If this one launches Season 6 it seems strange to include it in Season 5's sequencing, while that is the finale of Season 5 and is included in Season 6's sequencing. A nitpick, but still, it seems some confusion is inevitable and could have been avoided. I kind of agree Drogon, but that said remember this is the 26th scenario for season 5. Each season has had 26 regular scenarios since season 2. Moving this to Season 6 would make cause some to complain that season 5 was shorted. Thanks for making this available to everyone. Not only will it make for a great treat to play on Fargo PFS's 1st anniversary, more importantly it will be a chance to make factions relevant again. Without factions missions to help teach players the flavors of the different factions, they just haven't been a factor. I have no worry that there will be any problem of too many factions represented even if I only run 1 table since the vast majority of my players simply pick Grand Lodge because they don't see any reason to play another faction. Showing them the new flavor of the factions should help that. Kickass! Definitely look forward to running this one. I think it's fantastic this will be widely available in time to be counted. Thank you! Follow-up Question... Since this scenario becomes available after the start of Gen Con, how should the faction changeovers be handled? Our first local game day after this becomes available would be August 24th. Can we hold off switching to one of the new factions until after playing this scenario? My Osirion character, who is the one I'd most likely play this with, may hop over to Dark Archive for season 6. Would I play this as Osirion, Cheliax, or neither? I wanted to add my voice to those who thank you for making this available to anyone! That's amazing news! Quick technical question: is this considered as the retirement scenario for the nation-based factions? As they are not being retired, no. To be fair, that point is still being debated on the boards last I checked with no input from Mike or John as yet. Unless there has been something that I missed. This feels like a evolution of First Steps part 1. I really like it! There are currently 7 Quests within the scenario, with the game only experiencing details of 3 of the 7. With proper GM notations on the chronicle sheets, is it possible to play this scenario twice in order to experience 6 of the faction specific quests? With the proviso that no player gets to repeat a quest? EG. Playthrough 1: Dark Archive, Grand Lodge, Exchange. Playthrough 2: Silver Crusade, Scarab Sages, Andoran. This would double the play potential of this product and allow more PFS players to let their characters experience the changes in their factions.